It has been an extremely long and interesting summer for both the Edmonton Oilers organization and their fans. While it has been yet another off-season of substantial change in the Alberta capital, the Oilers are once again a team with many unanswered questions heading into what the masses are hoping will be a year in which this club makes substantial gains in the Western Conference standings. The biggest hole on this roster remains the same, as the backend still lacks anything resembling a true top pairing defenceman. While the addition of Adam Larsson has without question improved the overall depth of the group, its shortcomings are there for all to see. With that said, Edmonton’s inability to score goals with any kind of regularity is something many seem to be overlooking and one can’t help but wonder if that same trend will continue in 2016-17. When the decision was made to part ways with Taylor Hall in order to acquire the aforementioned Larsson to help address the most glaring need on the roster, the organization essentially decided to ‘rob Peter to pay Paul’. Considering the Oilers struggled to score with Hall in their lineup, removing the guy who was unequivocally the second best player on the roster and only on-ice ‘driver’ not named Connor McDavid wasn’t going to help with said problem. From an offensive standpoint, this team’s recent struggles have revolved around its lack of depth up front and a backend that has proven incapable of getting their skilled forwards the puck in motion to allow them the opportunity to do what they do best. While the addition of Milan Lucic, Jesse Puljujarvi, Kris Versteeg and a full season from McDavid could help offset the former, the latter may not be quite so easy to address. Would a healthy campaign from Oscar Klefbom, a repeat performance from Brandon Davidson, a step forward from Darnell Nurse and a typical season from Mark Fayne, Larsson and Andrej Sekera go a long way towards fixing things? Of course but the problem with forcing feeding players both minutes and situations they are not equipped to handle, is it generally tends to have a negative impact on their overall performance. Need examples? Just take a look back at any of the Oilers previous six seasons. Can Oscar Klefbom Stay Healthy? No question their depth is better but that minute eating impact guy on the backend is still nowhere to be found. In my mind, Klefbom and Larsson have the potential of developing into one heck of a pairing but it won’t happen this year. Let’s not forget that Klefbom has a grand total of 107 NHL games under his belt and has shown an inability to remain healthy for a full season, albeit due to bizarre injuries. As good as he looks, the kid has done nothing that points to him being ready to take on the role this team so desperately needs to fill. Now, could he handle a similar position on a better team and playing with a proven number one as a partner? Possibly, and that likely applies to his fellow countryman as well, but that means little. 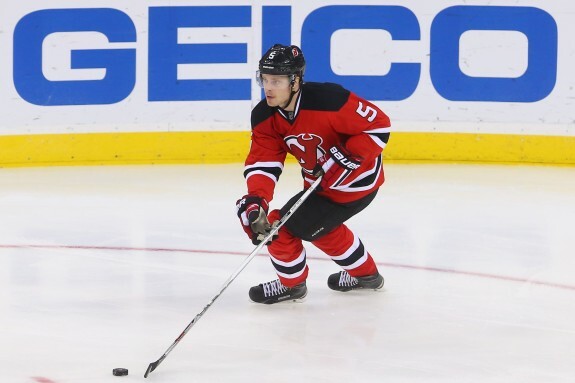 While it is no secret that the New Jersey Devils handed Larsson what were among the toughest minutes played for any rearguard in the league over the past couple of seasons, the talented Swede appears to be almost allergic to putting points on the board. No question some of that comes from his usage and playing with the Devils but the numbers are what they are. Larsson proved he could log major minutes for the Devils but doing so in Edmonton, and in the Western Conference, will be a completely different animal altogether. The former fourth overall pick will surpass the 300 games played mark this season, turn 24 years of age in mid-November and is about to enter the prime years of his career. For me, his ceiling is as a number two but on a team like the Oilers he will need to do even more than was being asked of him in New Jersey…not exactly the easiest of asks. Sound familiar? Well, it should as we have seen this show play out time and time again, most recently with none other than Jeff Petry. Too much too soon is almost never a good idea for defencemen at this level but at least this time around, Edmonton’s depth on the backend is far better than years gone by. While it should prove beneficial in helping the overall development of the group, it may not exactly translate into a substantial gain in the standings. If all goes well, a tandem of Klefbom and Larsson may end up being able to hold their own as a top pairing in 2017-18 and the Oilers would have finally solved their problem along the blue line. However, expecting that transformation to take place over the coming months would seem rather unrealistic. Some might argue that’s all well and good but how and why should that affect the offence? Well, we’ve seen this team’s defence look overwhelmed shift after shift, unable to break the cycle or do anything from keeping the opposition from hemming them in their own end for what feels like an eternity now. Has that strictly been on the blueliners? Of course not, but this collection of forwards is still far from a defensively sound group, so expecting a drastic change would seem naïve. After all, if a team can’t get the puck out of their own end, scoring goals could prove to be a tad difficult. Add to that the lack of a true quarterback on the point during the man advantage, though No. 97 will likely carry the power play on his back during certain stretches, and the same problems still exist. Seems fairly straightforward and it will continue to wreak havoc with Todd McLellan’s crew. Again, if certain players can maintain their previous levels and others take notable strides forward in their development, the Edmonton Oilers backend may end up being an actual strength for this club as early as 2017-18. Whether that will be enough to satisfy the masses for the coming season remains to be seen but until this group proves ready to contribute at both ends of the rink, they will have a tough time climbing up the Western Conference standings.